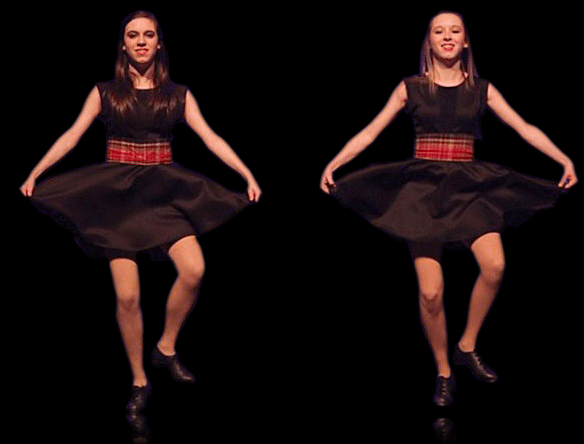 Traditional Stepdance is an old Celtic dance form and the root of Tap Dance. It is traditionally performed to fiddle and/or pipe music and sometimes mouth music. Reels, Jigs, Strathspeys and Clogs are the most common musical forms. Originally, hard soled shoes were worn but now metal clickers are more commonly attached to the soles of shoes. The dancer makes complex rhythms, either matching or in counterpoint to the rhythm of the music. At one time, the area in which a dancer lived could be told by the style of the movements. Gradually the styles have melded or changed as populations moved. Dancers saw new steps and movements performed by other dancers and then copied them but with a slight change to make it blend more with their own style. Although now it is more a solo dance form, sometimes with a set choreography, it was originally done as a group, in sets, with individual dancers occasionally breaking from the set to do a short solo step. Sometimes the dancers attempted to outdo one another, to the wild applause and encouragement of the rest of the group.